Engineering researchers have recently developed exciting advances in microwave noncontact sensing and analysis, with new applications in fields ranging from medicine to structural engineering, manufacturing to transportation. This book provides an authoritative look at the current state-of-the-art in the field. Drawing upon their years of experience in both cutting-edge research and industry applications, the authors address microwave radar for both noncontact vital sign detection and mechanical movement measurement. They explore key advances in everyday applications of microwave and Doppler radar, especially in the areas of radio frequency technologies, microelectronic fabrication processes, and signal processing hardware and algorithms. 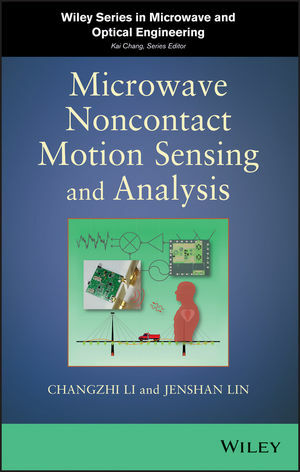 An important resource for engineers and researchers with a professional interest in micro-wave sensing technology, Microwave Noncontact Motion Sensing and Analysis is also a source of insight and guidance for professionals in healthcare, transportation safety, the military, and law enforcement. Changzhi Li, PhD, is Assistant Professor in the Electrical and Computer Engineering Department, Texas Tech University. His research interests include biomedical applications of microwave/RF, wireless sensor, and RF/analog circuits. Jenshan Lin, PhD, is a Professor in the Department of Electrical and Computer Engineering, University of Florida. Before joining the University of Florida, he worked for AT&T/Lucent Bell Laboratories and Agere Systems.